Localized treatment for drywood termites can be a viable alternative to full structure fumigation. In fact, there are times when some sort of Direct Wood Treatment protocol is the only feasible treatment option available. In some cases, the cost of evacuating or moving residents from their condominium or apartments for fumigation can be more than the cost of the fumigation itself. Another reason would be fumigating a structure that is connected to another structure that does not need treatment by common elements such as plumbing chases or conduits etc. Assuming you can locate all of the connections, the attached buildings still need to be vacated during the fumigation period, a fact that can be very difficult to achieve. 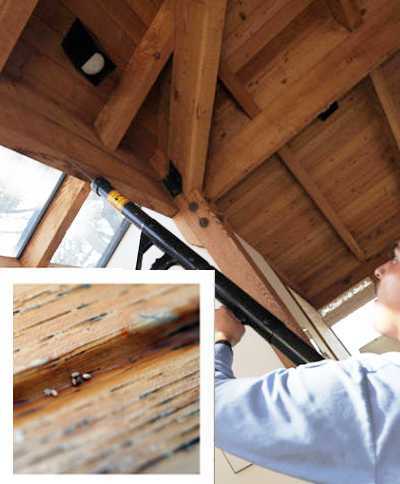 Wood decay fungi can infect and quickly destroy wood where there is a moisture problem. Borates are highly toxic to wood decay rot on contact and will kill the fungi and protect against future infestation.